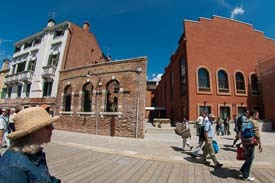 ABOVE: The LaGare Hotel Venezia (right) is Murano's first four-star hotel. We took this photo from the Murano Museo airport-boat and vaporetto stop, which faces the hotel. Murano has several hotels that are worth considering for a final night's stay if you have an early flight from Venice, since the Alilaguna airport boats take only 30 minutes to cover the distance from Murano to Marco Polo Airport. 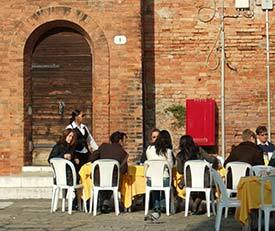 Visiting artists and glassmakers can put a strain on Murano's limited accommodations, so book early when possible. This four-star, 118-room design hotel opened in spring, 2013. (See photo at top of page.) It's right next to the Murano Museo waterbus stop, where--from April through October--Alilaguna Linea Rossa boats from Marco Polo Airport stop on their way to the Lido and San Marco in Venice's historic center. This hotel in the "town house suites" category is a bit cheaper than the Soffiador but has earned favorable guest ratings. It has 26 air-conditioned rooms with ensuite facilities, offers Wi-Fi Internet access, and serves breakfast on a terrace in good weather. You can reach it from the Alilaguna Linea Rossa stop at Murano Museo without crossing any bridges. Another excellent place to stay is the Casa Sulla Laguna guesthouse, which is small and inexpensive. Finally, Murano has a few vacation apartments that can be rented by the night or week. See The Comprehensive Guide to the Island of Murano (reviewed on page 8) for listings and descriptions, or try the excellent Ca' Mazzega Murano Grand Canal View Apartments, which consist of four holiday flats near the Murano Venier ACTV station. Murano has a fair number of restaurants, cafés, and bars scattered along its canals, next to the Basilica dei Santi Maria e Donato (right), and on the Campo Santo Stefano across the canal from the San Pietro Martire church. Some are pricey, but you can easily find snack bars, osterie, pizzerias, and gelato parlors for every budget. Just check the menus before you go inside. For recommendations with photos, see Michela and Nicoló Scibilia's Comprehensive Guide to the Island of Murano. If you're really short on cash, you can buy sandwich makings, pizza by the slice, and other snack foods at the two-story, wheelchair-accessible InCoop supermarket and shopping center. InCoop is near the Colonna Actv boat stop, on the fondamenta that runs south along the canal from San Pietro Martire. Fish is sometimes sold by weight. If the menu doesn't show a fixed price, know what you're getting (and what you'll pay) before you order.